VIA Technology’s Nano Processor has been out to the market for quite a while and was believed to outperform Intel Atom processor based on performance benchmarking tests. However, it doesn’t seems to be able to capture much market share from what being originally conquered by Intel especially when both of them are aiming at the same market segments in low power and embedded market applications. Now with the new announcement of the Trinity Platform from VIA Technology, it is expected to be able to broaden its scope by bringing the HD (High Definition) graphics performance of current netbooks to the next level. 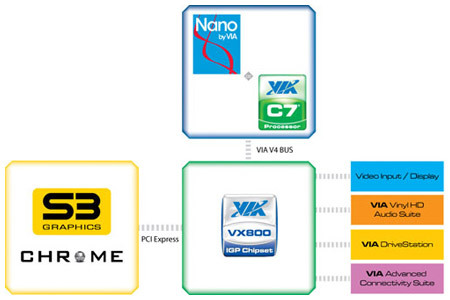 Trinity platform is based on VIA Nano processor coupled with its unified digital media chipset, VX800. It is further enhanced with a S3 Graphics GPU that connected to its chipset via high bandwidth PCI Express lane, With a 64-bit, out-of-order superscalar X86 microprocessor, a highly integrated digital media chipset and a S3 Chrome graphics accelerator, it is claimed to be one of the most powerful 3 chip solution targeted for mobile market. Worth to mention here, the highly power efficient processor and chipset doesn’t add too much heat and power consumption while it is able to boost up graphics performance significantly, that make it suitable for high performance per watt solutions. It is capable to support High Definition video decode with various famous video codecs ranging from MPEG-4, H.264, WMV-HD, VC1 and many more. Besides, the platform is featured with latest DirectX 10.1 and Open GL standards, Blu-ray with HDMI interface suitable for both office space and home entertainment system. All these are well packaged into Mini-ITX form factor and can be embedded on small PC systems that require superior computing power, HD video acceleration, 3D graphics for notebook and embedded markets.